Droll & Lock Bird is one of the best hand traps in the game, and it doesn’t look like it’s going away for a while. Once your opponent adds a card to their hand you can drop this Spellcaster and halt any more drawing or movement of cards to the hand from the deck for the rest of the turn. In the meta it is all about getting to what you need and want, and this card helps stop so many cards and monster effects that do that. It’s stats don’t matter, it’s Attribute doesn’t matter, it is too useful to pass up. Perfect for almost any side deck, and perfect for many main decks to run in sets of three. Any deck that depends on plowing through their deck via drawing (Dark World Danger! ), this card stops them flat. It is a necessity for the side deck at the very least. It made a lot of sense to review this card for Throwback Thursday during Trickstar week. This does make tomorrow’s card very predictable. In any case, Droll & Lock Bird is a Level 1 Wind Spellcaster-type monster with 0 Atk and 0 Def. The stats are wholly unimpressive. The effect is to discard this card to prevent both players from further drawing or searching effects from the deck to the hand. They scored poorly before because the first effect goes through and then both players are locked out. Other hand traps overshadowed this one by quite a large margin. However, with Trickstar Reincarnation you can let them search or draw after the Draw Phase, then use Reincarnation, then this to make them banish their entire hand and not draw any cards. It’s a very easy and searchable way to really mess with your opponent during any turn, but is obviously most brutal during the first turn. Outside of Trickstatrs, Droll & Lock Bird is still less impressive than other Hand Traps, but it’s worth running in the side at the very least. Score: 4.5/5 Art: 5/5 Ultra Rare is my favorite for this and many cards. 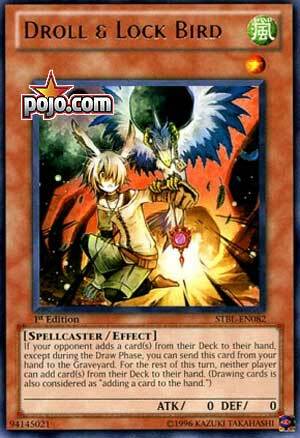 Throwback Thursday is a card commonly used in Trickstar decks, Droll & Lock Bird. Droll & Lock Bird is a Level 1 WIND Spellcaster with 0 ATK and DEF. ATK and DEF are bad, WIND is meh and Spellcaster is decent, but this card is a hand trap, so none of that truly matters that much. If your opponent adds a card(s) from their deck to their hand except during the Draw Phase, discard this card to prevent both players from adding cards from their decks to their hands (including drawing). You’re likely using this on the opponent’s turn, so you won’t be doing much of any searching on their turn. If your opponent highly relies on searching, then hopefully they searched their most important card first, otherwise they are locked away from it for the rest of that turn as they’ll have some dead search cards in their hand during that turn. A play in Trickstars is that when your opponent searches, you immediately activate Trickstar Reincarnation and then chain this so it will resolve first and then your opponent has to banish their whole hand and doesn’t even get to draw more cards, which sounds very unfair because you need cards to play the game. Droll & Lock Bird is a very powerful hand trap and it is stronger the more reliant on searching your opponent is, run in the main or side deck depending on preference, but it is probably a main deck in Trickstars for that combo with Reincarnation. Art: 4/5 A kid and his pet bird, how sweet. But given what it can do with Trickstars and for them, it suddenly found some life. Obviously, you’re immediately unimpressed with the stats…0 attack and defense, Level 1 (not even a Tuner, not that it matters much these days) Wind, to boot, although Spellcaster is worth something. Anyway, D&LB completely shuts down your opponent from adding a card to their Hand outside the Draw Phase (and an actual Draw effect is counted in the negation effect here, as worded on the card). You get versatility in that it specifically isn’t limited to a CARD (or cards), and wording is important, so that opens this card up more for you as well. Art: 4/5 The picture is fun, like the fire, like the bird, like the use of multiple colors, it’s very nice.